Petrotech’s Stand-Alone products provide specific turbomachinery functionality. Pre-engineered to improve user configuration and reduce costs, Stand-alone products may also be combined with other systems to enhance functionality or provide a low-cost configurable solution. Each of these control products includes field-proven Petrotech applications, a result of decades of extensive knowledge and experience in providing turbomachinery control solutions. The Em-400 is a multi-body anti-surge compressor controller that incorporates field-proven Petrotech anti-surge algorithms into a trim, rack mount package. The system is user configurable through the built-in color touch screen display. It includes more than 45 password protected configuration and display screens. No additional hardware is needed to configure the Em-400. The user can access a great deal of information, including tuning information, alarm status and a unique live compressor performance map. This controller may be used to control up to three compressor bodies. The Em-405 Stand-Alone Station Compressor Controller incorporates the Petrotech SCC (Station Compressor Control) with a built-in color display, resulting in an easy-to-use feature-rich control system. Part of the Petrotech Elements family of products, this system may be used to control up to four compressors. The Em-430 Stand-alone Steam Turbine Controller combines field-proven speed regulation and overspeed protection with built-in touchscreen display resulting in an easy to use feature-rich control system. Part of the Petrotech Elements family of products, this system may be used for mechanical or generator drive applications. 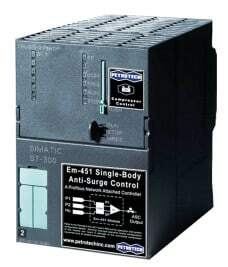 Designed to attach to an existing controller, the Em-451 delivers Petrotech’s field-proven configurable anti-surge control algorithms for single body compressors in a small, add-on controller. The controller is easily attached to any SIMATIC® Series 300 or 400 Master Controller via the Profibus communications protocol. The Em-451 module is equipped with anti-surge protection for a single-body (recycle loop) compressor and includes an integral recycle transfer control. An optional touch-screen display with pre-loaded screens is also available to supplement the existing display system. 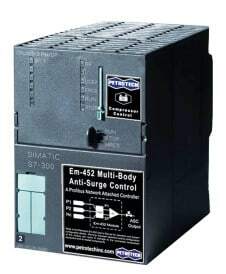 Designed to attach to an existing controller, the Em-452 delivers Petrotech’s field-proven configurable anti-surge control algorithms for multiple body compressors in a small add-on controller. The controller is easily attached to any SIMATIC® Series 300 or 400 Master Controller via the Profibus communications protocol. The Em-452 module is equipped with anti-surge protection for a multi-body (recycle loop) compressor and includes an integral recycle transfer control. An optional touch-screen display with pre-loaded screens is also available to supplement the existing display system.